Suddenly finding yourself working from home can be a very strange experience. You are finding the day starts a lot earlier. If you left home at 7am to be at work for 9am and got home at 7pm after finishing at 5pm, you've magically acquired 4 extra hours to the day. This is great, but it can lead to difficulties if you don't use these new hours wisely. The reason is simply that you'll find the concentration stakes hard, due mainly to distractions like seeing something which needs doing out of the window, the neighbours popping round, a good match on the TV or quite simply 'faffing' around because you feel you have ample time to do your work now. Better to work a flat out 6 hours than work 6 hours interupted making your work day stretch out to 10 ! I've switched on the PC to do a days 'Net' work at 8.30am and turned it off at 9pm having done about 4 hours work ! The rest of the time being spent on those 'I'll just pop down town and......'. So we have to set a discipline and treat the home during these hours as a work place, even if it means being a bit anti-social. 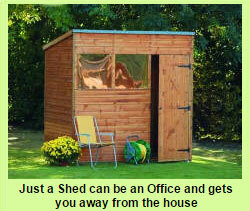 Treat your home as the business place, 'the office'. Have a separate area solely for the business and have all your necessary work 'tools' and files there. Have a daily action plan, even if it's just a large calendar on the wall. Use that in the same way you kept an office diary.morning, afternoon etc. Stick to that plan and don't budge from it. In that plan, set aside time for 'self'. Not popping down the shop, but time to relax and consider what's going on. Make sure your family are completely aware of the above. Your room is your room and no-one goes in it whilst you're in there. Sounds harsh, but it works. Although we are 'escaping' the rat race and 'the office', there is no reason we should simply discard all the positive things we have learnt through them. There are management skills you used to work on with your Team which you can use on yourself for a change. The last 20 / 30 /40 years of grind have not been wasted and you shouldn't see them as being a waste of time. They have given you invaluable skills. Maybe they gave you the funds to explore your new life as well !